There are no laws in place to specifically protect against attacks on Police Dogs and we are seeking to extend the cover a Police Officer receives in law. Just as Assistance Dogs have been recognised as "representing an extension of the assisted person" - we wish for Police Dogs to be recognised as "representing an extension of their handler as a Police Officer". We are therefore seeking for the law to recognise a Police Dog as a serving member of the Police Force and in turn treat any crime against a Police Dog as if they were a regular Police Officer. Currently an assault against a Police Dog is merely treated as Criminal Damage. We are campaigning to protect those Police Dogs who risk their lives to serve their communities. Following the review of all public service pensions carried out by Lord Hutton, the Home Secretary announced the Government’s position on the long term reform of police pensions on 4th September 2012 when she published the Reform Design Framework for the 2015 Career Average Revalued Earnings (CARE) police pension scheme. Along with UNISON we are running a member services day on 18th October at FHQs between 09.00 and 13.00. Attending will be a number of companies that provide services to officers and staff including our Group Insurers, Solicitors, BMW Mini, Copperpot Credit Union, Payplan and Police Insure. Have you seen this month’s edition of the national police federation magazine? 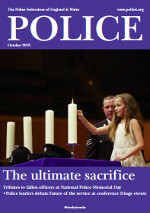 October's edition focuses on the national police memorial day and the tributes that were made to those officers who have made the ultimate sacrifice. Other articles look at issues surrounding cyber stalking and concerns over police officer burnout. Welcome to the new Cambridgeshire Police Federation website. Our aim is to improve communication between the Federation and our members. The website gives members access to a wealth of information about the Federation and the support and services it offers.